Chevrolet has, along with Honda, outlined its intention to integrate Apple’s Siri technology into production cars, in a system known as "Eyes Free". Handsfree technology, while useful in helping prevent drivers from becoming distracted whilst behind the wheel, isn’t without flaw; and by implementing this new, Siri-based system, major car manufacturers hope to make our roads even safer moving forward. The initial reports of Chevrolet’s Siri integration, which first came to our attentions at the end of last November, we got a fairly good insight of how the system would work. 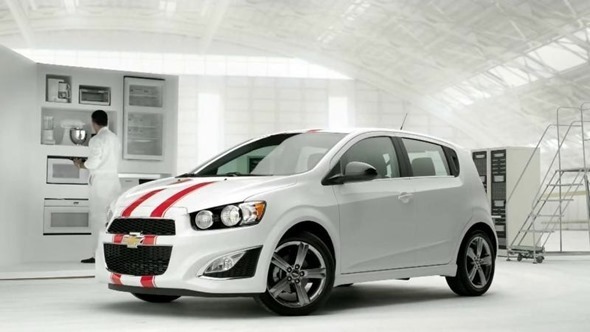 Now, following last month’s announcement that the 2013 Chevy Sonic and Spark would be among the first to feature Eyes Free, the company has just aired an advertisement showcasing the technology. According to iSpot.tv’s founder and CEO Sean Muller, the ad first made an appearance on Thursday on VH1’s Jump Start, and since that point, it has already been aired a further 81 times on national TV networks. Siri first made its way to the end user via iOS 5 and the iPhone 4S, and despite considerable fanfare upon launch, it has sat as a mainly dormant feature since. In the first few months, many ideas were offered as to how far the technology could eventually go, but despite that initial promise, there has been very little in terms of real-world implementation. That is, until now, and with both Chevrolet and Honda making moves towards this Eyes Free service, plenty of other manufacturers are also hopping aboard. Hyundai has already stepped out and stated its intention to bring Eyes Free support to a fleet of vehicles, and with Apple also having mentioned partnerships with industry leaders such as BMW, Mercedes, Land Rover, Jaguar, Audi, Toyota, and Chrysler, we certainly haven’t heard the last of Siri’s automated, robotic, yet slightly endearing voice. Having seen the ad, would you consider Eyes Free for your car when your favorite manufacturer hops aboard? You know where to drop the comments, so why not share your thoughts with us?